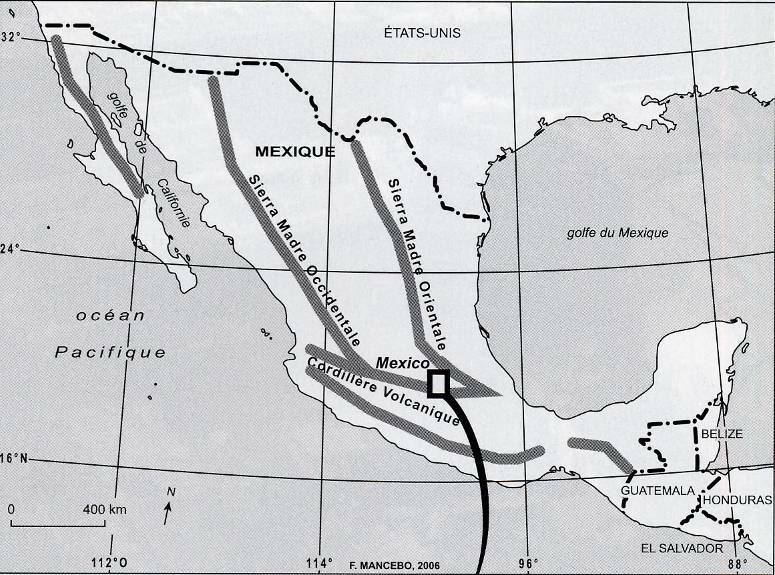 L’agglomération de Mexico, à plus de 2 000 mètres d’altitude, adossée à la Sierra Madre et la Cordillère Volcanique est assise sur un site accueillant mais redoutable. Il s’agit d’un des endroits les plus exposés du globe, soumis à une combinaison de risques naturels, de risques technologiques souvent mal maîtrisés dus à des industries lourdes, de nuisances, de cumul des polluants et d’un épuisement des ressources locales utilisables, tout particulièrement les ressources en eau. Après le séisme dévastateur de 1985, les acteurs de l’aménagement de Mexico tentent d’intégrer risques et durabilité dans la définition de nouvelles politiques urbaines. Mais, si les risques sont bien identifiés et des réponses sont données, leur applicabilité est quasi-nulle. Une approche normative et n’incluant pas l’ensemble de l’agglomération, mais utilisant les périphéries pour améliorer la durabilité des centres (sorte de durabilité importée à l’échelle de la métropole) explique cette situation. Comme dans le mythe de Sisyphe, acteurs locaux et nationaux tentent de faire remonter la pente au rocher du risque mais ce dernier finit toujours par redescendre ? C’est qu’en réalité le problème n’est pas le rocher. Le problème, c’est la pente, c’est-à-dire le substrat fait de représentations territoriales et d’usages de l’espace qui fondent la société mexicaine, sur laquelle roule le rocher. Mexico City is located at an altitude of over 2 000 metres where it occupies an attractive but hazardous site hemmed in by the Sierra Madre and volcanic mountain ranges.The site is one of the most disaster-prone locations in the world, threatened by a combination of natural hazards, poorly controlled technological hazards created by the city’s heavy industry, pollution – particularly air pollution and diminishing local resources, the most seriously threatened being water. Since the devastating earthquake of 1985, Mexico’s planners have attempted to address the questions of hazards and sustainability in the city’s new urban development policies. But although the various hazards have been clearly identified and appropriate responses determined, the latter have remained for the most part unimplemented. A normative approach that does not take into account the entire metropolitan area but uses the peripheral zones to improve the sustainability of central areas (a kind of imported sustainability at the metropolitan scale) explains this situation. Local and national players regularly attempt to address the many hazards to which the city is exposed but ultimately seem to make very little progress. Their situation is a little like that of Sisyphus trying to push his rock up the hill, but in this case it is not really the rock that is the problem but rather the slope. In other words, the real problem for Mexico City is the substrate composed of local representations and uses of space that underlie the very foundations of Mexican society – and on which the rock rolls. 1Mexico City, with over 18 million inhabitants, is the most populous metropolitan area in the world. The city, which was initially built according to a grid pattern, now covers some 6 000 km². Polluted and noisy, it has for a long time suffered from numerous environmental and pollution problems, exacerbated by its geographical situation. Mexico is crossed by two mountain ranges, the Sierra Madre Occidental and the Sierra Madre Oriental, which come together to the south of a volcanic cordillera. It is here at the southern point of the central Mexican plateau that Mexico City is located, at an altitude of 2 240 metres and close to the volcanic cordillera (map 1). Map 1. Mexico and distrito Federal. 2Mexico City is located in a basin created by the high mountains surrounding it, a topography that aggravates the effects of the severe air pollution suffered by the city. The only opening in the mountains is in the north-east, which is the source of the dominant winds that enter the basin and push the pollutants towards the mountains, where they become trapped and concentrated in the basin rather than dispersing. But this is not the only problem. The unsustainable nature of Mexico City dates back several hundred years and the city’s problems are many-faceted. 3The city is built on the site of former lakes and dried-out marshes. The historic centre was originally founded as Tenochtitlan, capital of the Aztec empire, on a site occupied over 500 years ago by lake Texcoco. The only viable and functional remains of these lakes can be found in the south-east of the city, in the borough of Xochimilco. This area will be discussed at length in the present article. 4Drainage of the lakes started long before the arrival of the Spanish. The Aztecs, who had themselves invaded this area a few centuries earlier, had started to drain the lakes and lagoons to create land for the increasing population and also so that they could build monuments and temples, taking over the sites of lakeside settlements such as Chalco. During the Spanish conquest Mexico City was founded on the site of Tenochtitlan (Musset, 1991), and lake Texcoco and the other lakes in the area were gradually drained from the time of colonisation until the start of the 20th century. This gave rise to a soft alluvial subsoil, over 6 metres thick. The soil compacts regularly, at a rate of about 6 cm per year. This gradual process causes the soil to move and buildings to collapse, a sort of permanent "creeping disaster". One of the greatest ironies is that Mexico City, certainly one of the biggest cities in the world, has developed on one of the earth’s most unstable soils (Tobriner, 1988). 5Furthermore, the entire city is located in a basin, in a former wetland area, surrounded by mountains. Originally, rainwater and water from melting snow in the mountains flowed into the Mexico Basin then infiltrated the soil, feeding the surface aquifers. Since the area was drained, it has been subjected alternately to devastating floods and long periods of drought, with calamitous water management adding to the problems. The indirect effects are numerous. When the wetlands were drained, the air became increasingly polluted as particles remained in suspension. In 1988, when lake Texcoco was partially refilled by effluent from the city, the pollutant concentrations in the air dropped immediately over the entire metropolitan area. 6Finally, the region is also subject to considerable tectonic stresses that cause violent earthquakes and volcanic activity. The two volcanic peaks, Popocatepetl and Iztaccíhuatl, rising to over 5 000 m are eloquent reminders of this instability. 7Floods, landslides, subsidence, volcanism, earthquakes – it would be difficult to find a more dangerous site. Mexico City is one of the most unbearable and most vulnerable cities on earth, exposed to a combination of so-called natural hazards, poorly controlled technological hazards stemming from heavy industry, pollution, including an accumulation of air pollutants, and diminishing local resources, particularly water. These different components interact in series to create specific disasters. The dangers to which the city is exposed are euphemistically called "complex hazards". This concept covers a wide spectrum of risks since the urban problems resulting from the breakdown in the social fabric after any kind of catastrophe are part of these “complex hazards”. 8The notorious earthquake of 19 September 1985 translated this "complex hazard" into reality. The massive vibrations that accompanied the earthquake temporarily modified the structure of the alluvial soil, which in places became quite literally “liquid”, swallowing up people and buildings. Elsewhere, the vibrations caused landslides, and more specifically a sudden vertical settling of highly plastic soils (photo 1). This caused extremely serious damage to poorly maintained buildings and those that did not meet even the most basic construction standards for this type of high-risk area. The homes of 180 000 people were either destroyed or damaged. 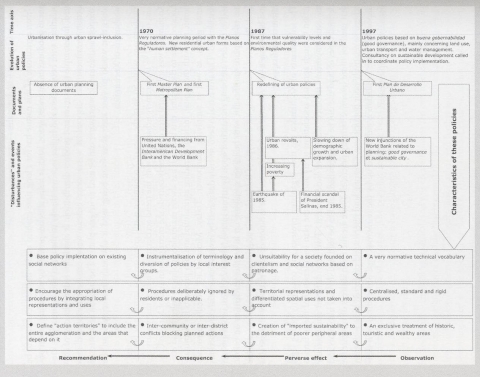 The collapse of six buildings alone cost the lives of 1 619 people (Gómez, 1991). A particular feature of this earthquake was that it destroyed modern buildings with high occupancy rates (international hotels and hospitals). Five hospitals collapsed completely, reducing the city’s capacity to care for the sick and injured by 28 %, which exacerbated the disaster even further. The number of human casualties from the catastrophe – over 6 000 dead – could have been much higher if it had occurred a few hours earlier when the city was asleep instead of when people were on their way to work. In addition to those who died or were made homeless, all the employees of the 1 200 small industries in the city centre, an area that was particularly hard hit, lost their jobs. The resulting urban unrest in 1986 together with financial scandals among the elite led to the population questioning the government’s legitimacy, marking the beginning of the end for the PRI (Institutional Revolutionary Party) hegemony that had lasted for more than 50 years. Photo 1. 1985’s earthquake in Mexico: building collapse. 9The combination of "earthquake + alluvial soil + inappropriate buildings" appeared clearly in the ex-post assessment of the different levels of vulnerability of the city’s buildings. The higher the buildings and the greater the plasticity of the soil, the greater the damage suffered… Furthermore, among the buildings built on the lake bed, the rigid structures (stones and masonry) proved more resistant than flexible structures (such as steel). It was the most central areas, and buildings of between 6 and 20 storeys in these areas, that suffered the most serious damage (Degg, 1989). Other types of building that were seriously affected were small apartment blocks: small low-rise buildings combining apartments and shops in the city centre, as well as rental apartment blocks and small 19th century houses, some of them run-down, housing large numbers of people. 10The consequences of this earthquake were atypical compared with those of similar catastrophes. In general, vulnerability increases with poverty and unofficial housing (Wisner, 1993). In the Mexico City earthquake, this was far from the case. Most deaths occurred in concrete/steel buildings in the city centre, in tourist hotels, hospitals and the historic areas that were undergoing gentrification in the heart of the alluvial basin. While many of the poor people who worked in the devastated buildings lost their jobs, it was the more wellto-do inhabitants who suffered the most serious consequences in terms of loss of life and property. In fact, the millions who lived in extreme poverty on the peripheries of the city lived in buildings that were constructed on more solid ground that was less sensitive to vibrations. In addition, their low, flimsy houses, randomly built from salvaged stone and masonry, proved to be more resistant to the tremors, and even those that collapsed caused fewer victims. This is a reminder perhaps that poverty and vulnerability are not always synonymous even though they are – sometimes wrongly – related (Mancebo, 2006-1). 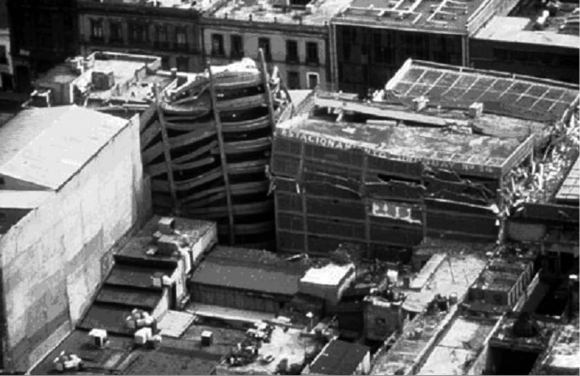 11The 1985 earthquake dramatically changed Mexico City’s urban development policy. Previously, urban planning was as rigid as it was ineffective and was based solely on land use. Until the end of the 1960s, Mexico City expanded without any control in the form of urban planning rules. New areas sprung up one after the other, creating something akin to non-cities. Policies focussed on getting rid of these areas. Then, under the influence of international organisations and pressure from the Interamerican Development Bank (IDB), extremely normative technical terms started to be introduced in relation to urban planning: the Plano Director and Plano Metropolitano (Master Plan, Metropolitan Plan) for example. This grand planning period saw new types of urban residential developments spring up in the outlying areas, financed by national and international subsidies for creating low-income housing (Guerrien, 2004) This vision was fully expressed by the United Nations in the human settlement concept. 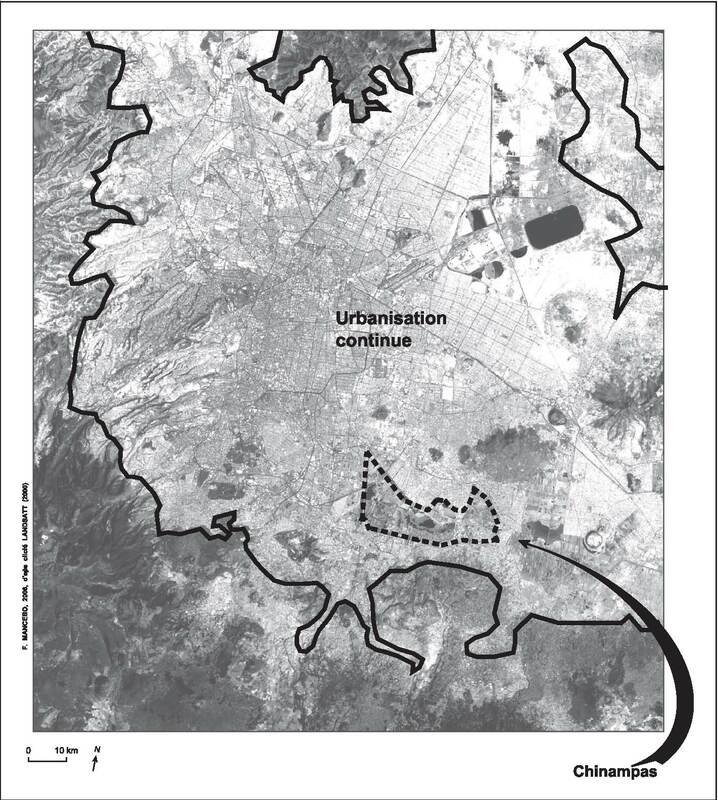 Applied to urban expansion, human settlement, with its new spatial divisions, quickly found its place in Planos Reguladores (Master Plans). 12In 1985, at the time of the earthquake, demographic growth and urban sprawl had slowed down considerably. New types of problems had to be faced, even though the city was still suffering from its previous hypertrophy. In fact, while urban pressure decreased and access to services improved, spatial segregation intensified. This could be seen in the landscape, which provided a stark reminder of the widening gap between social extremes (Banzo, 1998). The atypical nature of the consequences of the earthquake – it was not the poor who lost their lives, but the rich, and it was not the shanty towns that were devastated but the relatively new apartment blocks – and its economic cost revealed the true extent of the city’s socio-spatial disparities. The material damage of the earthquake, but particularly its symbolic impact, led to a radical rethinking of urban policy from 1987-88 onwards, with environmental quality and levels of vulnerability being seen as factors to be considered. 13Toward the end of the 1980s, planning recommendations from international organisations, and in particular the World Bank, also changed. Specialised terms were introduced concerning local governance and sustainable development: competitiveness, liveability, good governance and management, bankability. This type of language gave rise to the concept of the sustainable city. Buena gobernabilidad became the Mexican version of the World Bank’s good governance. Its aim was to consolidate human settlements by making their environ-ment, in the broad sense of the term, viable: drainage and sewerage, alleviation of various environmental problems such as noise and pollution, safety measures, etc. This policy was to be applied not only to Mexico City but to other Mexican cities. 14The least that can be said is that the attitude of Mexico City’s politicians towards this new approach was ambiguous. On the one hand, they used it to create a framework for new urban policies, which supposedly drew conclusions from the 1985 earthquake. But on the other hand, they were still tied to their traditional vision of state control and showed little enthusiasm. Although the approach seemed attractive, it did not really meet the development needs of a metropolitan area such as Mexico City, with its history of elitism and building programmes undertaken too quickly with no regulatory framework. 15In fact, the people of Mexico City did not identify with an administrative approach that simply had an appearance of being rigorous. The inhabitants themselves took on roles in this new approach and created a vocabulary that they modified to suit their own interests. The key word was comunidad (community) derived from the notion of good governance. It was a new term that was used in reference to the spatial limits of a neighbourhood with which a person felt a temporary sense of solidarity. Rather than talk about colonia irregular (irregular settlements) when referring to their urban districts, created haphazardly from salvaged materials under the watchful indulgent eye of the authorities whose clientele they form, the inhabitants defended themselves against their critics as a comunidad. It became a way of preventing their buildings from being demolished and also helped them to obtain subsidies. The term comunidad was seen as a magic potion. Its use can be traced back to the time of the 1985 earthquake, when neighbourhood community organisations were officially created to serve as a link with government departments (Annis, 1988). All kinds of problems could be solved in the context of the comunidad and it was a term that started to crop up everywhere. It is interesting to note that this notion became increasingly mentioned at a time when the solidity of community links within Mexico City had never been so threatened (Mancebo F., 2004). This situation raises the question of the links that form between actors and local areas in the context of the new urban development policy. 16Earthquakes are the most spectacular and the most vivid hazard in the collective memory of Mexicans, but there are many others in Mexico City: floods, landslides, subsidence, fires, dangerous and poorly maintained industrial installations, and huge traffic jams. When combined, these natural and industrial hazards become complex, turning this metropolis, characterised by its incredible anarchical urban sprawl, into an unbearable place to live. Consequently, even though the 1985 earthquake convinced local politicians of the need to include risk management in their urban development policies, earthquakes have not been at the heart of the new approach. Instead, attention has been focussed on "slow" hazards, namely air and water pollution. 17In 1997 a new Plan General de Desarrollo Urbano (General Urban Development Plan) based on the new policies was drawn up and a sustainable development consultancy was called in to coordinate the implementation of the plan. The principal concerns were land use, urban transport and water management. 18Relating water management to land use and identifying the threat of water shortages as a "slow" hazard certainly made sense. The urban sprawl that was characterised by numerous colonias irregulares, irregular settlements on the periphery of the city, had two major consequences. A great many colonias were set up in mountainous areas with no sewage treatment facilities: sewage was therefore evacuated towards the valley where it infiltrated the soil and polluted the surface aquifers. Indeed, the entire city had facilities that could treat only a minute fraction of its sewage and was therefore causing massive pollution to ground water supplies: the flow of wastewaters known as aguas negras (black waters) and chemicals from fertilisers, resulted in high concentrations of heavy metals and bacterial pathogens in the water. 19The problem is not just with the quality of water, but also the quantity. Indeed, the demand for water from the whole of the metropolitan area of Mexico City is extremely high, the result of rapid urban growth due to government centralisation policies, the high concentration of industry and the demographic explosion. Between 1960 and 1970 the urbanised area grew by almost 50 %, and the same happened between 1970 and 1980. The Mexico basin aquifers have a very long recharge time. Their use should therefore be limited to their very slow recharge rate; otherwise they will be exhausted within a few generations. But this is not what is happening: in the Mexico basin, 42 m3 of water are extracted per second whereas the recharge rate is barely 23 m3 per second. Furthermore, the colonias irregulares on the periphery of the basin are situated on aquifer recharge sites: urbanisation prevents water from penetrating the soil and reaching the aquifers, making the situation even more dramatic. 20The problems created by overuse of ground water do not simply concern availability of water. In fact, the "soft" soils described above are rich in clay. Their stability is closely linked to their hydration level. When ground water becomes exhausted, the soil dries and the clayey layers become compressed. This results in subsidence – often sudden – of the soils in the whole of the Mexico basin: apartment blocks sink and collapse, and all the buildings become fragile. In short, the calamitous management of water resources is causing similar devastation to what happened in the 1985 earthquakes, albeit through a slower process. 21Land and water use is thus at the root of the city’s "slow" hazards and it is the poor management of these two resources that make Mexico City an unbearable place to live. It is not surprising that these two issues were primordial in the first Plan General de Desarrollo Urbano. However, although the policy itself is appropriate, its effectiveness is largely compromised by the fact that attention is focussed solely on the historic centres, tourist districts and residential areas. The extremely pernicious effects of this differential treatment of centres and peripheral areas are destroying in fine the laudable efforts of the new policy. 22The plan includes programmes to encourage companies to save water and others to promote the recovery of rain water in private homes and public buildings (hospitals, schools, etc.). In terms of technical structures, a water supply network that should cut down on the number of leaks is planned, as well as sewerage and water treatment structures at the outlets of deep lined/stone/tunnels for the evacuation of sewerage and storm water so as avoid contamination of the ground water (Carmen Durán de Bazúa, 2003). There are even plans to create separate drinking-water and non drinking-water systems. But, aside from the extreme uncertainty surrounding the implementation of such plans, the measures do not concern the outlying areas of the city. 23These peripheral areas and the areas beyond are not just being neglected, they are also being used to the benefit of the more central areas. The sustainability of Mexico City’s relatively rich centres is being orchestrated at the expense of the sustainability of poorer areas. Such so-called imported sustainability is by no means a genuine solution to the problem. Imported sustainability is a term used when a territory guarantees its own sustainable development by making other territories pay the cost of this sustainability: transferring pollution (exporting waste) or polluting activities, under-priced purchases of natural resources (Pearce, Markandya, Barbier, 1989). The territory in question covers the needs of its population by complying with the general conditions of sustainability in appearance only. Its internal sustainability is guaranteed, in reality, to the detriment of external sustainable development, since its problems are exported. Looked at in this way, there is only true sustainability when conditions concerning internal sustainability and external sustainability are both satisfied. This implies defining areas of action that are sufficiently extensive. 24The term imported sustainability can be used in the case of Mexico City insofar as the development plan provides for flood prevention by diverting the water into the numerous rivers in the neighbouring state of Hidalgo. Along the same lines, the plan provides for large protected areas and land reserves aimed at stopping urban sprawl. Most are situated in the south-west of Mexico City, in the delegacion (or borough) of Xochimilco (map 2). Together, the delegaciones form the Districto Federal de Mexico. Xochimilco is vital for the entire metropolitan area, since it is here that are found most of the catchment areas that ensure the supply of water to the capital (Mancebo, 2006-2). Map 2. Xochimilco chinampas in urban area of Mexico. 25But the inhabitants of Xochimilco were not consulted either by their delegacion or by the authorities of the Distrito Federal. This borough does not have the same water problems as the rest of the metropolitan area. Even worse, land and water use in Xochimilco (urban market gardening is practised on marshy land, houses are built in the middle of plots, and the remaining land is gradually being urbanised) is incompatible with the policy of creating protected areas and land reserves. The plan has therefore been rejected but, in the event that it is implemented, inhabitants have already asked for compensation for the problems it will create for them. 26In Xochimilco artificial agricultural land was created almost ten centuries ago by dredging the mud at the bottom of the lake that occupied the site and using it to create artificial gardens on floating wattle rafts. The rafts sank further and further into the water, ultimately becoming fixed to the bottom of the lake. These artificial gardens, at first mobile, slowly took root. They were called chinampas. When the wattle reached the bottom, trees planted on the edges of the plot took root and consolidated the ground. The long narrow strips often incorrectly referred to as "floating" gardens were an original form of intensive and diversified agriculture, producing maize, beans, chillies, amarant but also flowers, in a labyrinth of canals. This form of urban farming directly linked to the presence of marshy areas close to the initial urban centre contributed to the emergence of an original type of spatial organisation. The role of the chinampas in the history and economic activity of Mexico City was – and remains – important. 27Urban agriculture of this nature has for a long time enabled under-utilised resources to be put to good use: manpower, space, land. It helps alleviate poverty by providing urban populations with better diets and higher incomes thanks to the direct and indirect jobs created, for example in tourism and product distribution. It also helps reduce the cost of collection, treatment and disposal of waste, since human waste can be transformed into compost and domestic wastewater can be used to irrigate plants. The creation of protected zones that would prevent such areas from being used is obviously unacceptable to the inhabitants of Xochimilco. 28Furthermore, while 56% of the area of Xochimilco is still given over to farming or lies fallow, over 30 % is extremely urbanised, with the trend accelerating. 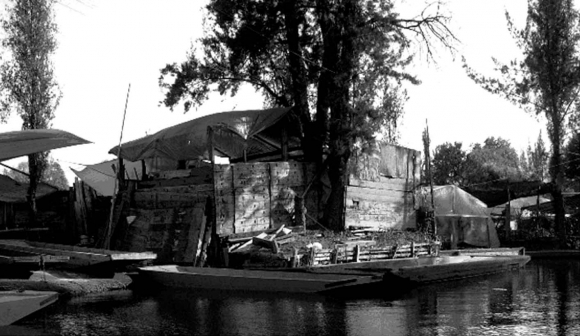 In fact, thirty years ago Xochimilco was still a rural area completely outside the metropolitan area of Mexico City. Located close to the capital, this borough has always maintained political, cultural and economic ties with the capital, including trading agricultural and fish products for manufactured goods, as well as supplying manpower. Today, Mexico City literally surrounds Xochimilco. The area has also been severely disfigured by invasive unofficial constructions and its borders are being encroached upon by urban sprawl (photo 2). Most urban growth has taken place unofficially, with buildings springing up in market gardens or on public land. Pressure is increasing on this type of land, which is acquiring a new residential value and becoming a new resource for inhabitants. The creation of land reserves will cause this resource to disappear. Photo 2. Urban “invasion” in Xochimilco chinampas. Source: F. MANCEBO, 2003..
29The inhabitants of Xochimilco are thus organising protests and constantly taking legal action through agrarian associations to try and get the plan withdrawn. For them, land is the only important resource; water is of little interest. Two very different and spatially defined types of land use can be distinguished: land to be sold and divided into plots and that used for more intensive farming practices. These are the main sources of revenue for otherwise relatively poor populations. Creating land reserves and protected areas is thus an impossible task: regulation is either held up by the numerous legal proceedings or is deliberately not implemented. Source : F. Mancebo, 2006. 30In Mexico City, local and national players regularly attempt to address the many hazards to which the city is exposed but, try as they may, and despite some promising signs, in the end they seem to make very little progress. It’s a little like Sisyphus trying to push his rock up the hill, but in this case it is not really the rock that is the problem but rather the slope. 31In other words, the real problem is the substrate composed of territorial representations and uses of space on which Mexican society is based and on which the rock rolls. 32The undesirable effects of the measures that were meant to include sustainability in the Plan General de Desarrollo Urbano highlight the lack of logic that exists in trying to turn an unliveable place into one that is liveable through a purely normative approach and without including all the areas involved. Mexico City, situated as it is at a high altitude and with its many different topographies and soils, is one of the best examples of this reality. 33Policies applied to large high-altitude metropolitan areas should therefore, on the one hand, be applicable to sufficiently large and inclusive areas to prevent a situation of imported sustainability, and on the other hand should combine management of resources, mobility, urban development methods, land use, hazards and "slow" hazards. 34Such policies would thus need to be flexible enough to include the differing perceptions held by various populations concerning priorities as well as changes in these perceptions. In the case of Mexico City, soil quality (for farming and housing) and land for building were for a long time the most sought-after resources and the ones that had to be best preserved, while air and water were considered inexhaustible. After the 1985 earthquake, for reasons mentioned above, Mexico City became aware of the importance of water, both as a limited resource and as a risk factor. In addition to its use value, it has a strong option value, for medium- and long-term human consumption, as well as a strong existence value, even if only for stabilising the soils. 35But the inhabitants of Xochimilco, who are not subjected to the same constraints as the rest of the population of Mexico City, do not share this point of view. For them, essential resources are land and building plots. They do not see the point in introducing regulations that prevent them from benefiting from these resources in order to preserve a water resource that they do not consider to be important, since it provides them with nothing, and for which they receive no compensation. The definition of resources depends on the society, the time and the circumstances. Unless the sensitivity of societies to resources and their appropriation of underlying problems is taken into account, any sustainability policy will almost certainly be doomed to failure. ANNIS S., 1988. – "What is Not the Same About the Urban Poor: The Case of Mexico City". In J.-P. LEAVIS (ed.). Strengthening the Poor: What have we learned?, Overseas Development Council. Washington DC. BANZO M., 1998. 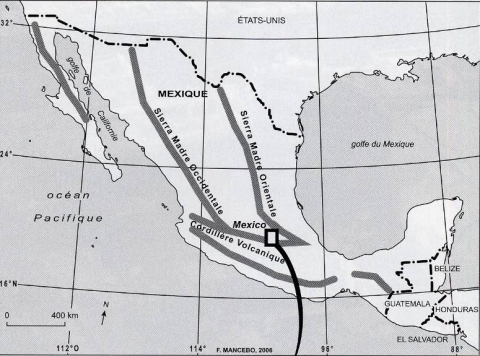 – "Processus d’urbanisation de la frange périurbaine de Mexico: approche méthodologique". L’Espace géographique, n° 2, pp. 143-154. CARMEN DURÁN DE BAZÚA C., 2003. – "Large-scale Changes in Mexico City’s Basin: Air Quality, Water Availability, and Geospheric Characteristics". Sixth Workshop on Mexico City Air Quality, report n° 37, pp. 19-20, Massachusetts Institute of Technology. DEGG M.R., 1989. – "Earthquake Hazard Assessment after Mexico 1985". Disasters, n° 13-3, pp. 237-254. GÓMEZ M. A., 1991. – "Reducing Urban and Natural Risks in Mexico City". In A. KREIMER and M. MUNASINGHE (eds.). Managing Natural Disasters and the Environ-ment, pp. 56-57. World Bank. Washington DC. GUERRIEN M., 2004. – "Mexico: l’enfance agitée d’une mégapole éclatée". Urbanisme, n° 334, pp. 31-38. MANCEBO F., 2004. – "Quel futur pour Huitzilac, municipio rural aux portes de Mexico. Entre contraintes urbaines et environnementales". La Géographie, Acta Geographica, n° 1512, pp. 47-65, Société de géographie, Paris. MANCEBO F., 2006. – "Vous avez dit risques “naturels” ? Alerte et gestion des catastrophes en milieu urbain: le cas de la Nouvelle-Orléans". Colloque international Interactions nature-société, Université de Nantes. La Baule. MUSSET A., 1991. – De l’eau vive à l’eau morte. Enjeux techniques et culturels dans la Vallée de Mexico (XVIe-XIXe siècles). Éditions Recherche sur les Civilisations. Paris. 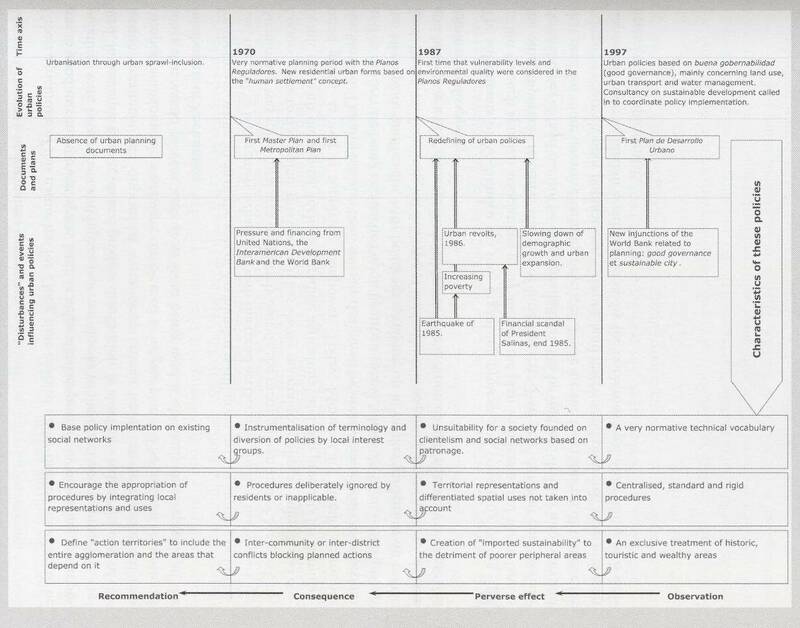 PEARCE D., MARKANDYA A., BARBIER E. B., 1989. – Blueprint for a Green Economy. Earthscan Publication. Londres. TOBRINER S., 1988. – "The Mexico earthquake of September 19, 1985 – past decisions, present danger: an historical perspective on ecology and earthquakes in Mexico City". Earthquake Spectra, n° 4: 3, pp. 469-479. WISNER B., 1993. – "Vulnerability to Disasters: Power, Scale, and Daily Life". GeoJournal, n° 33-2. François Mancebo, « Natural hazards and urban policies in Mexico City », Revue de Géographie Alpine | Journal of Alpine Research, 95-2 | 2007, 108-118. UMR Pacte-CNRS, Université Joseph Fourier – Grenoble 1 IGA, 14 bis avenue Marie Reynoard, 38100 Grenoble.